block belonging to Wymeswold Country Furniture awaiting her next delivery. hen Bill McBean and his wife Jenny decided to buy a van to deliver the restored antique pine furniture they sell at their shop at 17 Far Street in the pretty Leicestershire village of Wymeswold, thoughts of acquiring a modern vehicle were immediately dismissed. Bill and Jenny wanted some-thing special... something with style and character, and something that reflected the quality and craftsmanship of the lovely old furniture they sell in their converted Georgian stable block. Scanning the 'for sale' pages of vintage vehicle magazines, they came across what looked to be the ideal vehicle for their needs – a 1930s Bedford WS van with a 27bhp six-cylinder petrol engine. After travelling to Warwickshire to have a look at the vehicle, a deal was struck and DOH 206 was driven back to its new home. 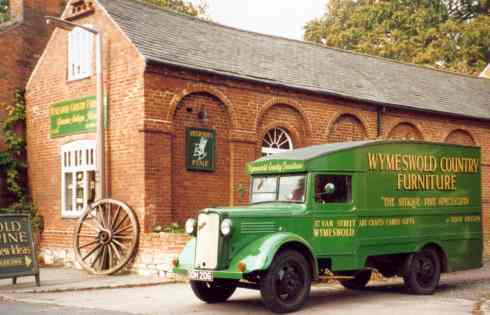 After receiving a coat of smart green paint, she was sign-written by hand in traditional style and Bill and Jenny's distinctive delivery van soon became a familiar sight around the roads of Leicestershire. DOH 206 began life with Davenport's Brewery, having been supplied to them as a cab and chassis in 1936 when it was fitted with a purpose-built body frame and canvas tilt specially designed for those familiar 'beer at home' deliveries. During the war the vehicle was requisitioned by the Ministry of Defence and converted into a flat bed. She was sold to Mr Hatton, a market gardener in the Derbyshire town of Melbourne, who used her as a truck to ferry produce to and from local markets. She later saw service with two other market gardeners before being laid up in a field and left to the mercy of the elements. It could easily have been the end of the road for this faithful old workhorse. Her fortunes were soon to change, however, when she was entered into an auction at Measham, along with several other old vans and lorries, from where she was purchased by a Warwickshire-based vehicle enthusiast who fitted the current box van body and rallied her briefly at steam and vintage shows. The van passed to her current owners in 1992 and has served them loyally ever since. Apart from the fitting of a new set of tyres and tubes and a replacement water pump, plus a bit of work on the steering pinions, the van has encountered few mechanical problems over the past nine years and long may she continue to make deliveries with style! Owner' Bill McBean stands alongside the reliable work-horse in which he has made deliveries with style for the past nine years. 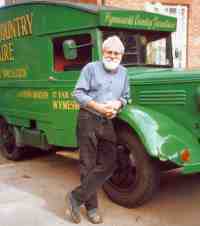 For further information about Wymeswold Country Furniture telephone Mr and Mrs McBean on 01509 880309. We are grateful to Brian Howes, 819 Hucknall Road, Nottingham for permission to reproduce his original article and colour photographs that were published in "Best of British" magazine issued December 2001.